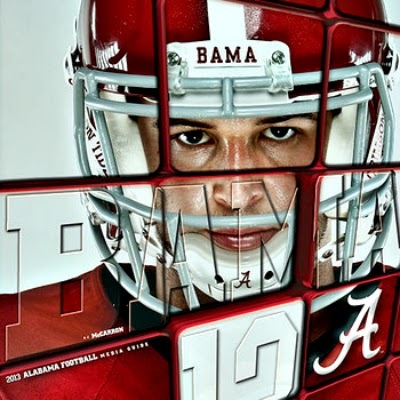 Alabama quarterback, senior AJ McCarron, is having another superb season. He has only lost three games in his collegiate career. (www.rolltide.com). Quarterback AJ McCarron has had a fantastic career at Alabama as his collegiate career is almost over, one Bowl Championship Series, BCS, Bowl game remaining. One AFC College Scouting Director told NFL.com Albert Breer that McCarron is similar to New England Patriots' quarterback Tom Brady. McCarron is a senior and he has a career record of 45-3 as the Crimson Tide's starting quarterback. In his collegiate career, he has thrown 75 touchdowns against only 13 interceptions, 8,632 yards and has a completion percentage of 67.0. He has also won two BCS National Championships in 2010 and 2012. His quest for a third BCS National Championship is nearly impossible after Saturday's game. On Saturday, McCarron lost a game for the third time in his career as then fourth-ranked Auburn defeated the then top-ranked Crimson Tide, 34-28. He had three passing touchdowns against zero interceptions, 277 passing yards and a 58.6 completion percentage. This included a play-action pass to wide receiver Amari Cooper that led to a 99-yard touchdown (https://www.youtube.com/watch?v=HL1Abv5adys). McCarron has had a great season, thus far. He has thrown for 26 touchdowns against only five interceptions, 2,676 yards and a 67.6 completion percentage. His tremendous success at college led to an AFC College Scouting Director comparing him to Brady. "Good size, outstanding touch on all throws, can make all the throws but only has average arm strength," the executive said. "Outstanding progression-read quarterback, makes throws to his second and third reads consistently. Doesn't turn the ball over. Winner. Mentally tough. Has the moxie and cockiness most great QBs have. Very similar to Tom Brady in stature, athletic ability, arm strength, touch and the most important category--wins." McCarron has shown that he has the potential to be a good NFL quarterback. In the video below, he is able to make some great throws to his receiving corps. There are some interesting statements the AFC College Scouting Director made in the aforementioned statement. The first interesting statement that director made was that McCarron is similar to Brady in stature. McCarron and Brady are both six-feet, four-inches. However, Brady weighs 11 pounds more, 225 to 214, according to sports-reference.com. Having a very similar stature does not necessarily make a quarterback great. New York Giants' quarterback Eli Manning is six-feet, four-inches and weighs 218 pounds, according to sports-reference.com. Very few NFL experts and fans would think that Manning has the same skill-set as Brady. The second interesting statement that the director made was that McCarron has the same arm strength as Brady. It is ludicrous for the director to say that after he or she said earlier in his statement, "...(McCarron) only have average arm strength." McCarron can make some nice throws, but it also helps that the Crimson Tide have a dominant running attack. The Crimson Tide's running game forces opposing teams to stack players in the box to try and stop the run. This allows McCarron to have more options than most collegiate quarterbacks. McCarron has had running backs like Trent Richardson and Eddie Lacy who had great collegiate careers and were the focus of opposing team's game plans. Brady typically does not have that luxury. The team's 'featured' back, Stevan Ridley, has been benched multiple times this season for fumbling. This has forced Brady to do what he does best, lead numerous Patriots' scoring drives. He is able to do this while the opposing team typically knows that he is going to pass the ball, which makes it even more impressive. This season, Brady has been able to make non-household name receivers like Kembrell Thompkins, Aaron Dobson and Julian Edleman look good with his precise throws. Brady's precise passes throughout his career has led to three Super Bowl victories in five appearances. The third interesting statement that the director made is that McCarron is similar to Brady because of wins. McCarron, three-year starter, has been the starting quarterback longer on the Crimson Tide than Brady was at Michigan, 1996-1999. At Michigan, Brady did not consistently start at quarterback until his Junior year, 1998. As the Wolverines' two-year starting quarterback, Brady led his team to a 20-5 record. McCarron has only lost three times as the Crimson Tide quarterback. It also helps that the Crimson Tide have consistently had great teams since Nick Saban became the team's head coach in 2007. During Saban's current coaching stint, thirty-three Crimson Tide players have been able to play in the NFL succeeding their collegiate career. The very talented Crimson Tide rosters have definitely contributed to the impressive records they have had since Saban's arrival. A collegiate quarterback leading his team to a great record does not guarantee him great success in the NFL. There are three other quarterbacks who were able to win at least 40 games at the collegiate level; Boise State's Kellen Moore, Texas' Colt McCoy and Georgia's David Greene. Moore, 49-3 collegiate record, is in the midst of his second season with the Detroit Lions and has yet to throw a pass. He is listed on the Detroit Lions' website as the third-string quarterback behind Matthew Stafford and Shaun Hill. McCoy, 45-8 collegiate record, is in the midst of his fourth season and has had the best career of the three. He has thrown for 21 touchdown passes against 20 interceptions and 4,401 yards. He started 22 games for the Browns over two seasons before joining the San Francisco 49ers as a backup quarterback. Greene, 42-10 collegiate record, never threw a pass during his three-year NFL career while with two different teams. Comparing any collegiate quarterback, like McCarron, to a future NFL Hall of Fame quarterback, who many fans and experts consider the greatest quarterback, is asinine. It is highly unlikely that McCarron is even the first quarterback selected in the 2014 NFL Draft. There are teams that are probably enamored with the idea of making Bridgewater or Johnny Manziel of Texas A&M their franchise quarterback. If Breer is right, then NFL teams are unlikely to draft McCarron before the third round.